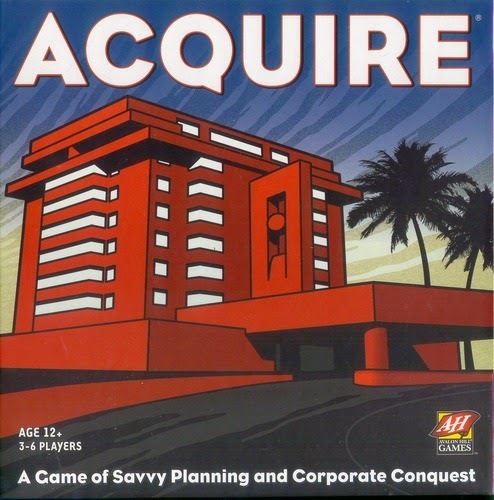 Having now detailed the path to the production of the test marketing edition of Acquire, the next step – and the most interesting part of the story, for me – is going through the game’s journey to the Acquire we know and love still today. This is where Sackson’s habit of drafting his letters – and saving the drafts – makes all the difference; as a result it’s possible to follow nearly the whole path. More than 50 years later and the game is still a monumental achievement that I beg people to play every other week. Definitely worth the read. North Star Games has released some of the most enjoyable party games that have come out in years. To be honest, Wits and Wagers is about the only trivia game that I think is worth playing. So when they start posting on BGG to let everyone know that they are going to start publishing strategy games, I think this should be a cause for excitement. 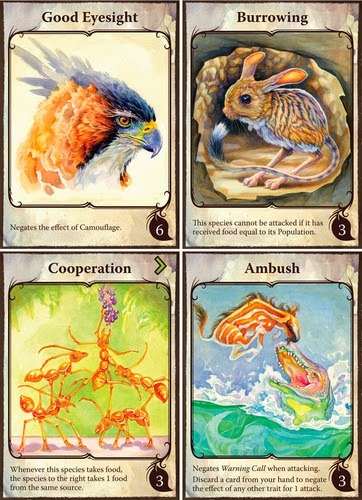 Their first choice: an update and reprint of a Russian game from 2010 called Evolution: Origin of Species. Lucky for us, they've taken some time to develop the game further to iron out some of the balance issues with the original version. 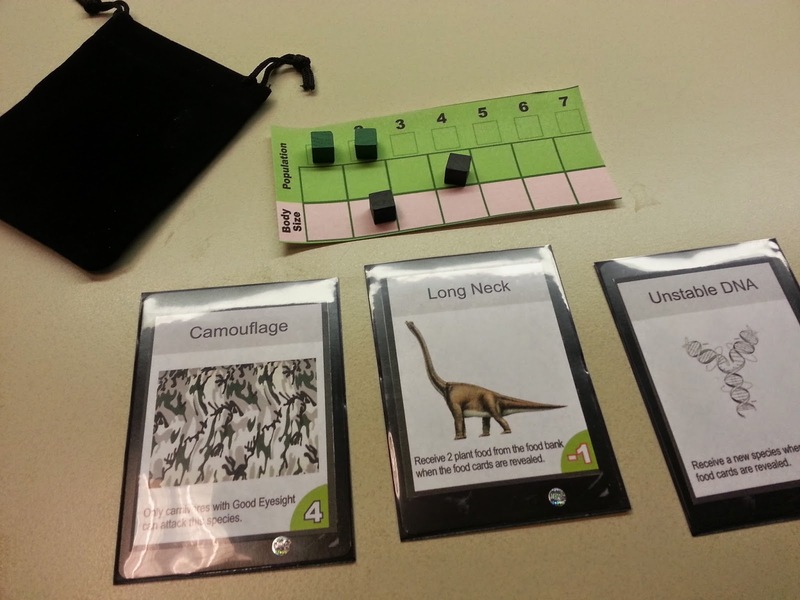 They've also been kind enough to provide DoM with a prototype copy so we could get some plays in before the release. discard to create a whole new species in front of them. Extra cards can be held for later turns which can be quite useful. Once all the cards are chosen, the plant food is revealed. This is often to the sound of groans of the players as there will usually not be enough plant food for all species, especially in the later rounds. Then, going around the circle one at a time, players take plant food till it runs out. Once the feeding is done, species' populations drops to the amount of food recovered and the food taken is set aside to be scored at the end of the game. Often species will not capture any food in the round and will go extinct much to the dismay of the owning player. What makes the game interesting are the traits players add to their species to try and increase their chances for survival. Traits like 'foraging' (species takes 2 food each time), 'unstable dna' (player gets another species when plant food is revealed), and 'cooperation' (neighbouring species gets a food when the species gets a food) all make things a little less predictable. But the most important trait, by far, is the 'carnivore' trait which allows a species to attack and consume other species, including possibly another of the same player's. Carnivores can't eat plant food so they must attack another species of a smaller body size. Each attack drops the victim's population by 1 (zero population and you go extinct!) and the predator gains a number of meat food equal to the victim's body size. Now this particular aspect of the game will probably be what people like and dislike the most about the game. Once players go carnivore - and they will need to at some point as plant food is so sparse as populations increase - the direct attacks will be swift and vicious. But since so much food is generated each time from 1 population they don't usually eliminate a species. And if they do, the victim gains extra cards to compensate - a nice balancing rule for this new edition of the game. Since players can replace traits with new ones, one can also swiftly respond to carnivores in future rounds by evolving differently with traits like 'climbing' and 'hard shell'. So the "take that" aspect of the game is definitely there but not overwhelming. One can easily defend by evolving differently or just fattening up their species. 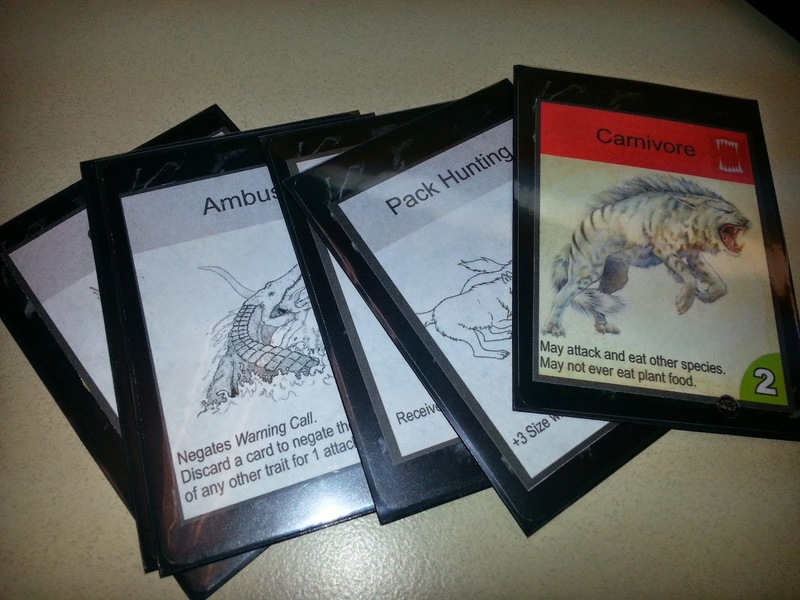 Once the cards run out, the final round is played and then the players score up their points for all the food they took throughout the game and the number and population of their surviving species. Simple. There were a few rules issues we had to iron out in our plays but this makes sense for a game that is still officially "under development". All in all, it's a pretty straightforward game which is keeping with the simplicity of the current canon of North Star titles. However, with Evolution North Star has moved directly into the strategy game market. 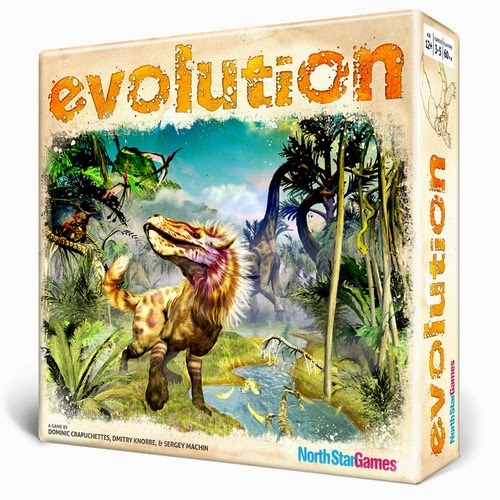 Evolution is a good choice: an easy-to-learn, strategic but not heavy game of hand-management which has enough chaos and nastiness to appeal to Ameritrash lovers but not enough to alienate a Eurogamer like myself. It's smart strategy by a company that clearly knows exactly where they're heading. For the last month, I have been missing my usual Sunday evening board game group as HBO is once again playing Game of Thrones, a fantastic show my friends and I are obsessed with. Now I've played the big Diplomacy-like board game for GoT but I really didn't enjoy it as it seemed to stall to a point of utter boredom about halfway through (not enough incentive to attack, total flaw!) I'm thinking the Guess Who version which is described in this article on Nerdist would probably be WAY more fun. "Hmmmmm...... did they die in the Red Wedding?" 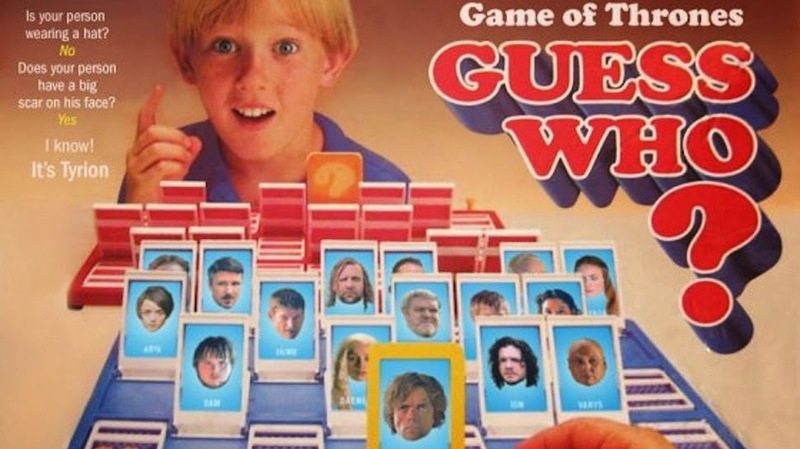 You can print off real images to paste on to your own version of Guess Who at the above link. Fun!